Successfully Added 4 Channel DVR Kit - 7 Inch LCD Display, 4x 720P Waterproof Cameras, Motion Detection, Night Vision, Mobile Support to your Shopping Cart. With this all in one DVR kit you can keep an eye on all that's important in your world and enjoy HD footage on site or remotely thanks to its network connectivity and mobile phone support. 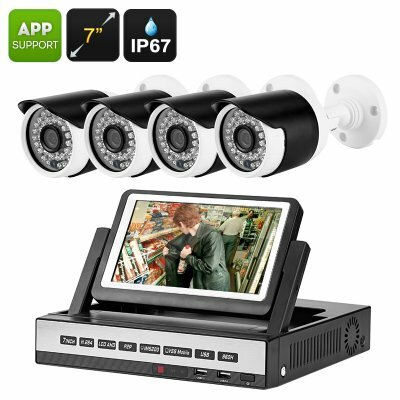 Secure your property with this 4 Channel DVR Kit, featuring 4 waterproof cameras and its own built in 7 inch LCD screen to watch the live feed directly. This surveillance kit can work as a comprehensive CCTV system or when connected to your local network will bring remote viewing potential. So it via computer or Smartphone ( using the XMEye phone app) you can watch the live video feed from anywhere in the world - just so long as you have a a network connection. As well as recording stunning video footage you can equip this DVR with up to 4 microphones, letting you obtain audio recordings to accompany the video footage, this brings a new dimension to your surveillance so a fuller picture of every event can be had. With SATA HDD support for 4TB or storage and making use of D1 / CIF recordings while using H.264 compression you will be able to record several hours of continues video and audio footage from each camera. Each of the 720P cameras can be located strategically around your premises, and due to their IP67 protection you're free to place them indoors or out. With 10 meters of cabling for each you can cover a large area suitable for most small homes and businesses. Each camera supports up to 4 detection areas and has up to 15 meter night vision so they will stand guard over your property day and night. With the alarm notification via email and event recording to the HDD nothing will escape the view of this powerful sentinel. This 4 channel DVR kit comes with a 12 months warranty, brought to you by the leader in electronic devices as well as wholesale surveillance systems and security gadgets..